Press Release - National Emergency Management Organization - June 17, 2017 - NEMO and the National Met Service hereby informs the general public that due to a broad low pressure area which is slowly developing in our region, heavy rainfall is expected along the coast and over the southern part of the country tonight and tomorrow. The concern is for localized flooding in low coastal communities and flash floods near rivers and streams especially in the south. 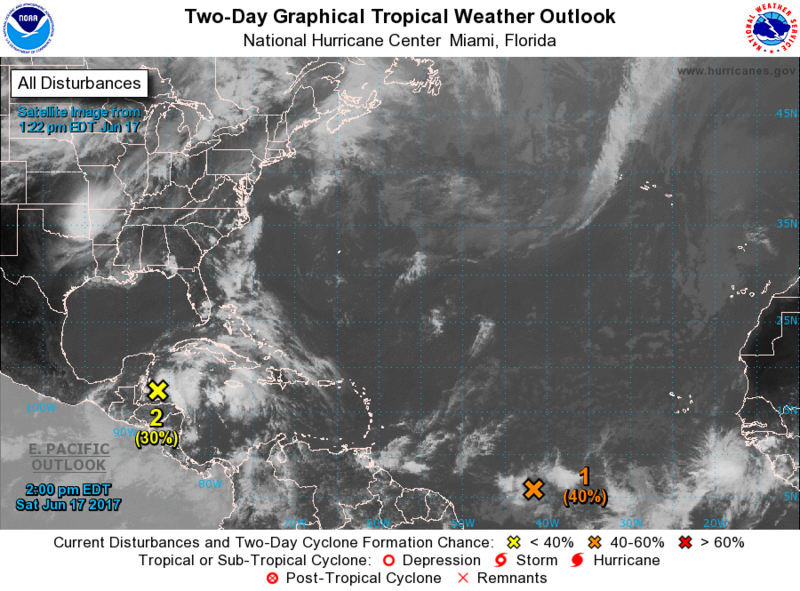 During the remainder of the weekend some development is expected as the system moves slowly north-westward across the Yucatan Peninsula and over portions of northern Belize. A tropical cyclone could develop next week over the southern or central Gulf of Mexico. People in coastal and southern parts of the country are advised to make the necessary arrangements to protect life and property. If you are at risk to flooding be prepared to move to higher grounds, with family or friends or to a community shelter and check on family members and neighbors who might be in need of assistance. If you live on the cayes and along the coast review your evacuation plan and be prepared to evacuate when advised. Review your family emergency plan. Keep handy, a first aid kit, basic tools, lanterns, batteries, flashlights, and non-perishable foods. Keep an extra supply of medication. Secure at least three (3) days supply of food and water. Plan for one (1) gallon of drinking water per person per day. Always remember to trim trees and secure your roof, windows and doors. Safeguard your important documents and make plans for your pet. Animals are not permitted in public shelters. Farmers must have a plan to secure their animals. Fisherfolks are urged to listen to the weather bulletin before going to sea. Do not wait until it’s too late to take action. Drivers are asked to drive with extreme care to avoid accidents due to slippery road conditions. The public is asked to continue to pay attention only to the official reports and advisories as NEMO and the Met Service continue to monitor this system. Do not listen to rumours. Stay alert.